Mesa Verde National Park is in the Four Corners area of Colorado, so named because this is where the borders of Colorado, New Mexico, Arizona, and Utah meet. We arrived on Saturday, April 19th, before the true tourist season. The campground in the park was only open for primitive camping and none of their sites were large enough for our trailer. 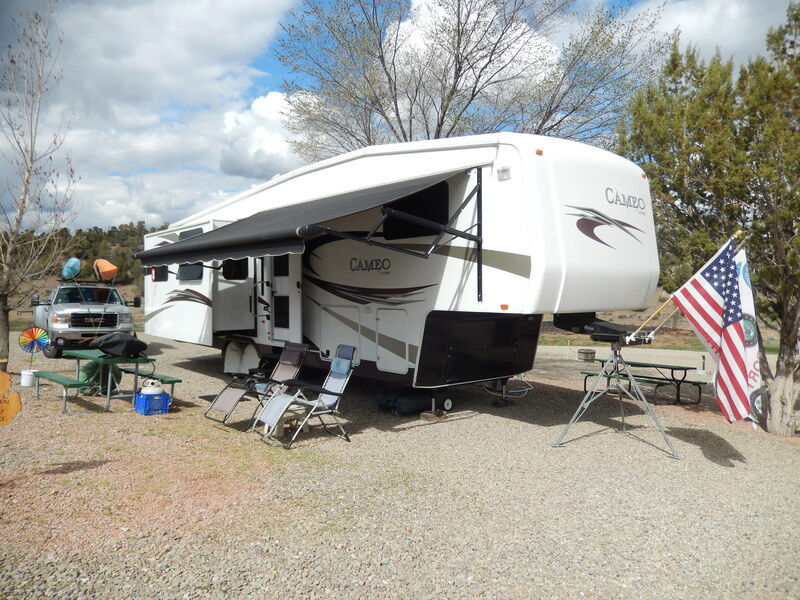 So we stayed at the Mesa Verde RV Park, a half mile from the Park Entrance. We were quite happy with our choice, as it is a very nice park and convenient to the National Park with a great view of Lookout Point. 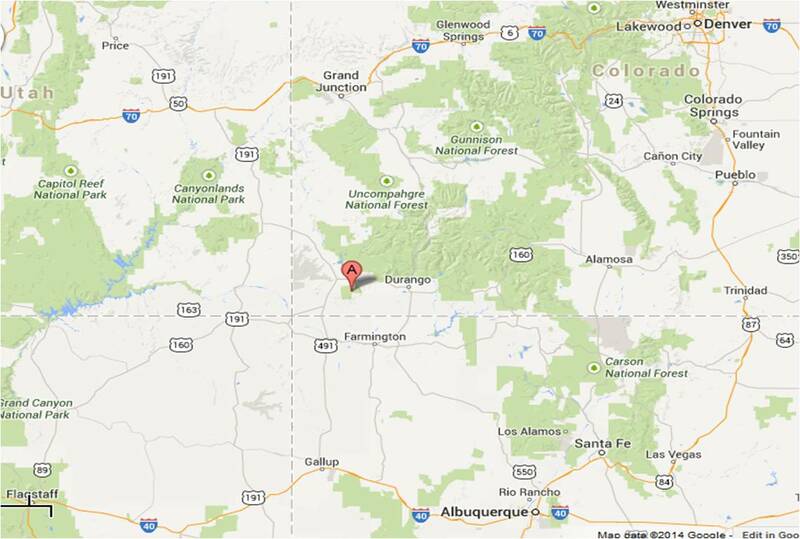 The nearest town is Mancos and we found a Methodist Church to attend Easter Sunday services. It was interesting to attend services in such a small town and we were welcomed as though we were visiting relatives. 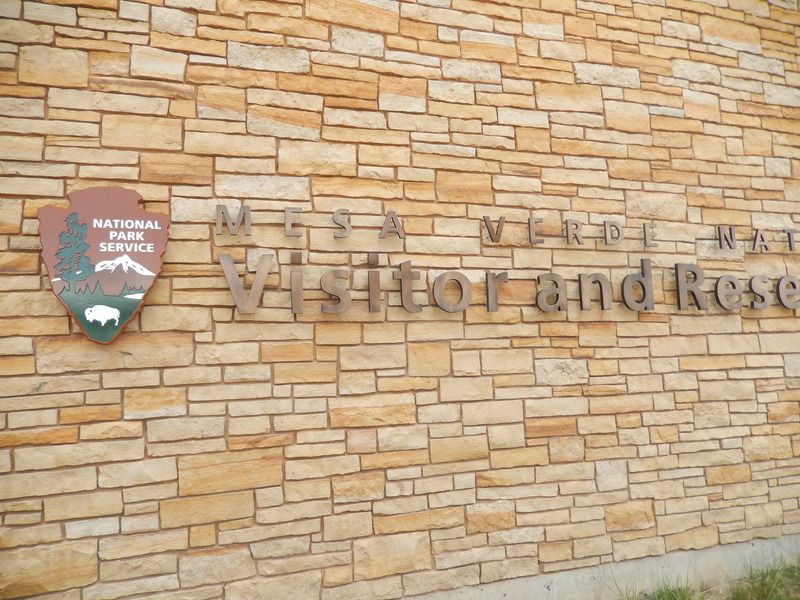 That afternoon we drove to the National Park Visitor Center to get tickets for the Ranger-led tours as well as general information and maps for the park. We learned that the Ancestral Pueblo Indians settled in Mesa Verde (literally translated as “green table”) in about 550 AD. They lived on the fertile mesa top, often in clustered semi-subterranean “pit houses.” About 1225 AD they moved into communities built into the cliff alcoves. Around 1300 AD, they abandoned these dwellings and migrated south into New Mexico and Arizona. There is no evidence as to why they moved from the mesa top into the cliff dwellings and why they eventually migrated south. The next morning we drove to the park to take our first tour of the day – Balcony House. This was an interesting cliff dwelling that has a balcony, protected by a wall along the cliff. None of the other dwellings we saw had such a wall, and it is a cause of much speculation among archeologists. Getting in and out of these dwellings was an adventure in itself. We had to climb a 32-foot ladder and crawl through an 18-inch wide passage to enter the site. To leave we had to climb an exposed cliff on ladders and a series of stone steps. 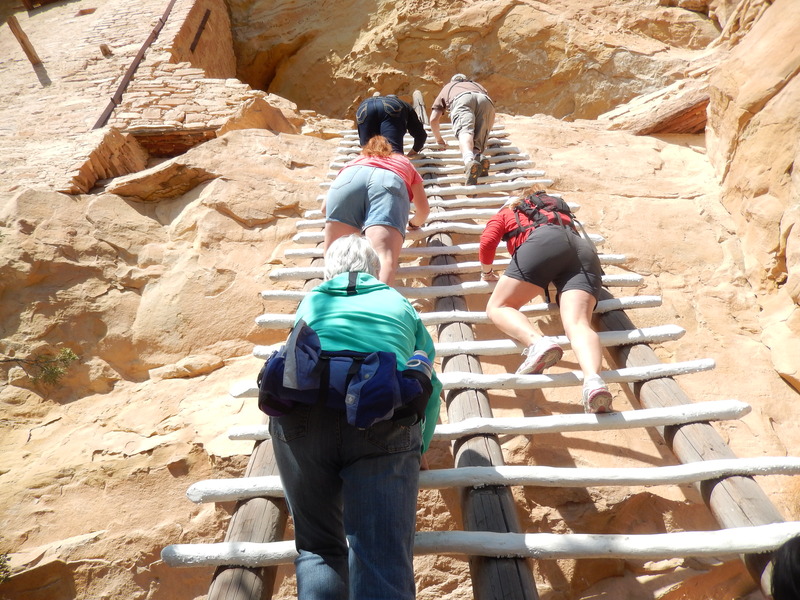 The Ancestral Puebloans didn’t have these ladders and steps to assist them. The engineering technology and the difficulty of constructing these dwellings was truly amazing. These dwellings used stone, carved by hand with stone tools, yet the corners are as square as any modern building. 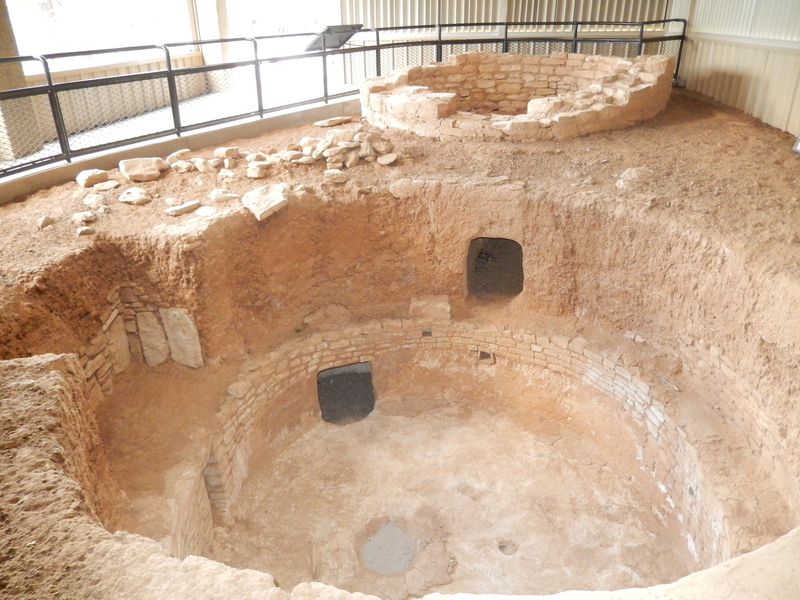 The “kivas,” circular sub- subterranean chambers, reportedly used for social and ceremonial gatherings, were amazing examples of sophisticated engineering. That afternoon we toured the Cliff Palace, the largest of the cliff dwellings. Cliff Palace contains 150 rooms and 23 kivas, and supported an estimated population of 100 people. It is thought that Cliff Palace was a social, administrative center with high ceremonial usage. The Ranger that led our toured encouraged us to challenge current theories about the Ancient Pueblo Indians. 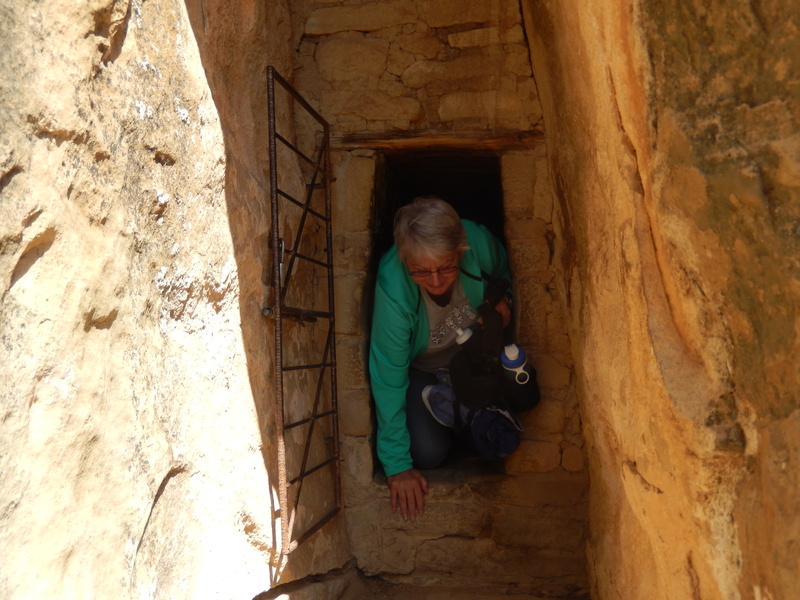 For example there is a structure in Cliff Palace called the “Head Man’s House,” but our Ranger commented that among the Ancient Pueblo Indians, the matron was the primary leader within the clans, and suggested that the “Head Man” may well have been a woman. Later we visited the Chapin Mesa Archeological Museum. After seeing the remains of the culture it was interesting and enlightening to see how they lived, grew crops, hunted for game, and took care of their families. We saw how the use of hollow gourds developed into waterproof woven pots, and eventually to kiln-fired pottery. Our next stop was to see the Spruce House. This is considered to be the best-preserved cliff dwelling in the park. It was one of the more interesting dwellings to visit as we were allowed to wander around the rooms with more freedom than in any of the other dwellings. For example, the Park Service has restored a kiva and you are allowed to climb down into it and get a sense of what it would have felt like to attend a meeting or ceremony in one. Our final stop in a very full day was not a stop but a series of stops on the Mesa Top Loop Road. 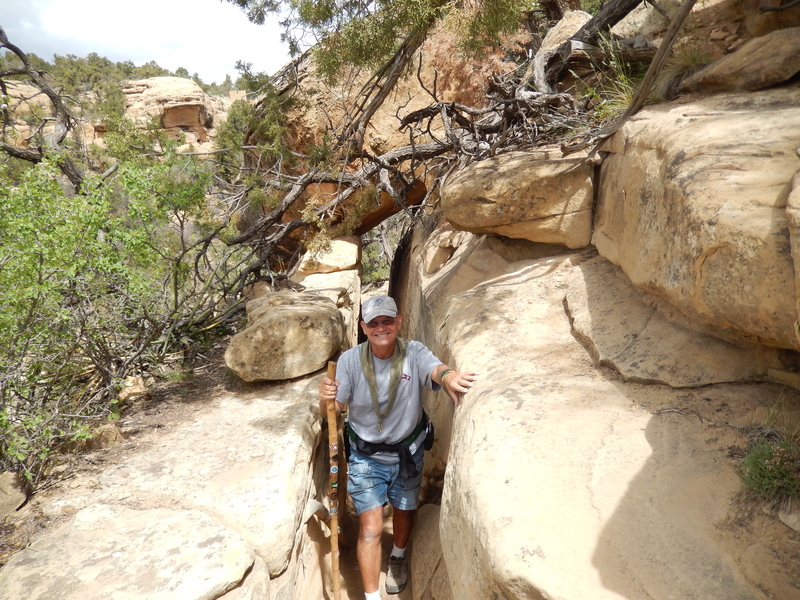 Along this route we were able to see twelve archeological sites that revealed a full range of architecture from the earliest pit houses to the latest cliff dwellings. It was interesting to see the progression of buildings and how later buildings were often constructed on top of earlier dwellings. The most fascinating site on the loop was Sun Temple. It was the last structure to be built by the Pueblo Indians. It contained nearly 30 rooms, but was never finished. There is no evidence that it was intended as a residence and archaeologists believe it was intended as a place of worship. We can only speculate why they put so much planning and effort into something like this and did not complete it. Lookout Point is the most prominent terrain feature as you enter the park and we hiked over two miles (round trip) to the summit. 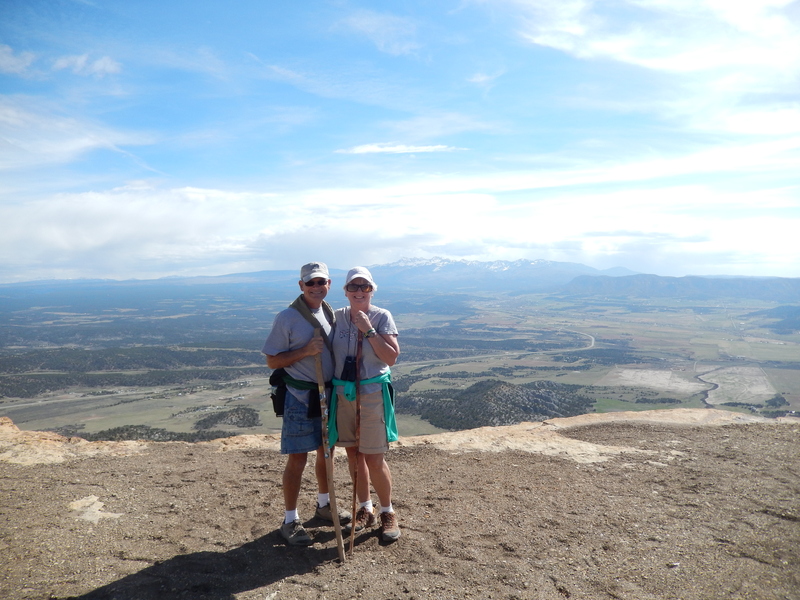 We enjoyed what could be called the most spectacular view of the Montezuma Valley. We could look into four states from this point. Our next hike was the Petroglyph Point Trail. This is considered to be a challenging trail and it certainly was that. There were steep climbs and descents, as well as some narrow passageways that were a very tight squeeze. The views along the trail were absolutely fantastic. We could look across the canyon to see one cliff dwelling after another. 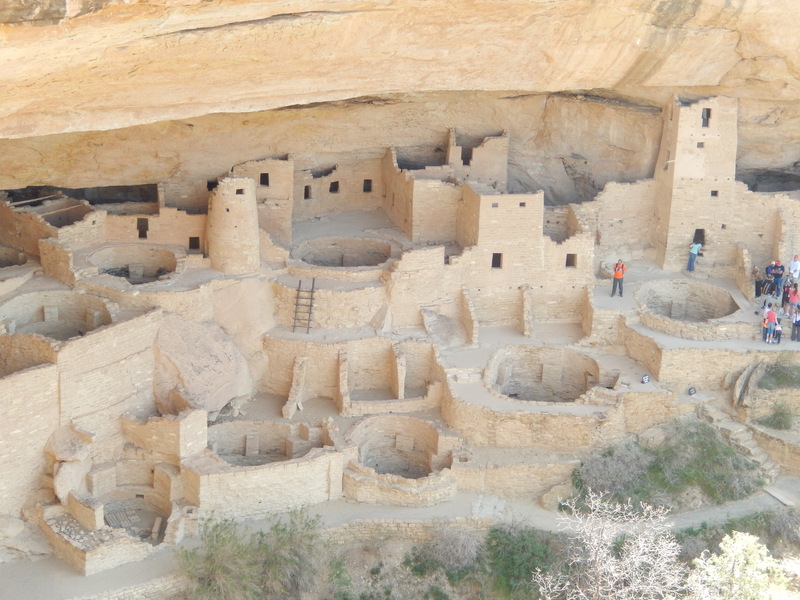 I believe many people think there was one big village at Mesa Verde, but there are over forty documented cliff dwellings scattered around the edge of the mesa. 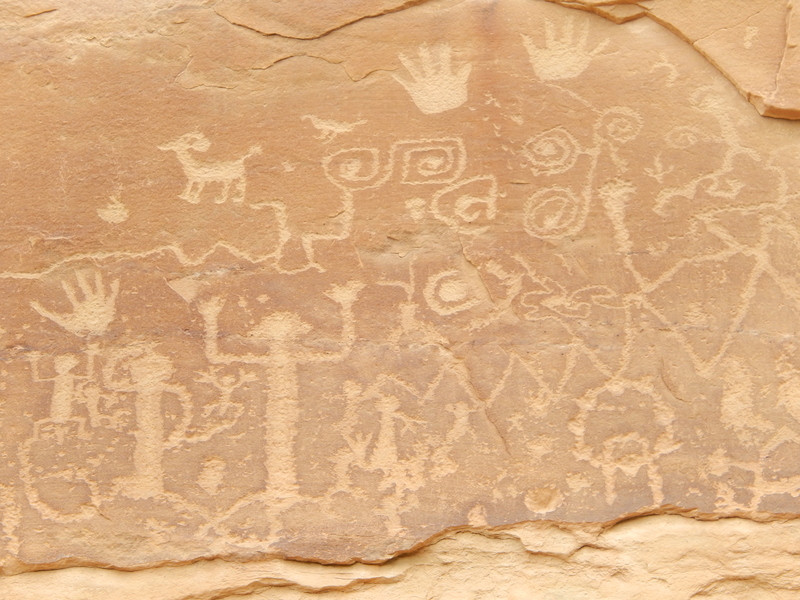 At Petroglyph Point we observed these Puebloan carvings. An interpretive sign gave possible meanings of what the Ancient Pueblo Indians were trying to convey. On our way back to the RV park we stopped at the Far View Sites, a mesa top farming community. Far View was one of the most densely populated parts of the mesa from A.D. 900 to about A.D. 1300. Nearly 50 villages have been identified within a half square mile area, and were home to hundreds of people. Here we saw five villages that had their own reservoir. 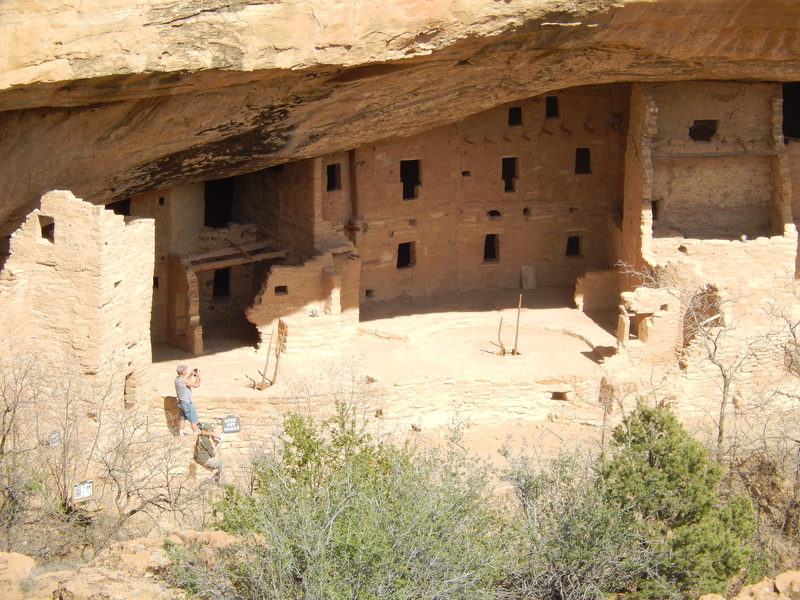 While the dwellings were more advanced than the original pit houses, they were similar to what we saw at the cliff dwellings with blocks of connected rooms with centrally located kivas. It is believed that these people remained here while others moved into the cliff alcoves because of the fertile farming areas. On our last day in the area I hiked the Knife Edge Trail. This trail follows the route of the original entry road into the park that was built by the Civilian Conservation Corps in 1914. The road proved to be difficult to maintain. At times it could only handle one vehicle at a time and was often closed due to landslides. It was abandoned when the Park Service built the Prater Ridge Tunnel. As I hiked along it I could imagine how difficult it was to maintain. While it was an easy hike overall, there were spots where the entire trail was almost covered with loose rock from landslides. I couldn’t imagine what it was like to try to drive a car along it! 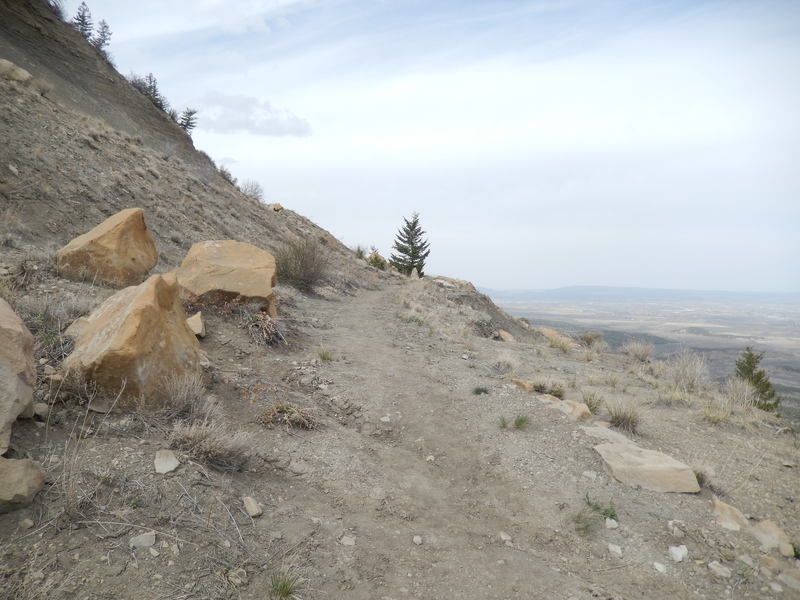 When I finished this trail, it was still early in the day so I hiked a portion of the Prater Ridge Trail as well. It was quite a steep climb to the mesa top, but the views of Morefield Campground and other areas of the park were worth it. Then the weather turned sour on me – cold, windy, and drizzling rain, and I headed back to our warm, dry trailer. We departed Mesa Verde on Thursday, April 24th on our way to Arches National Park near Moab, UT. We were looking forward to meeting our oldest son, Scott, and his family there for a fun weekend. 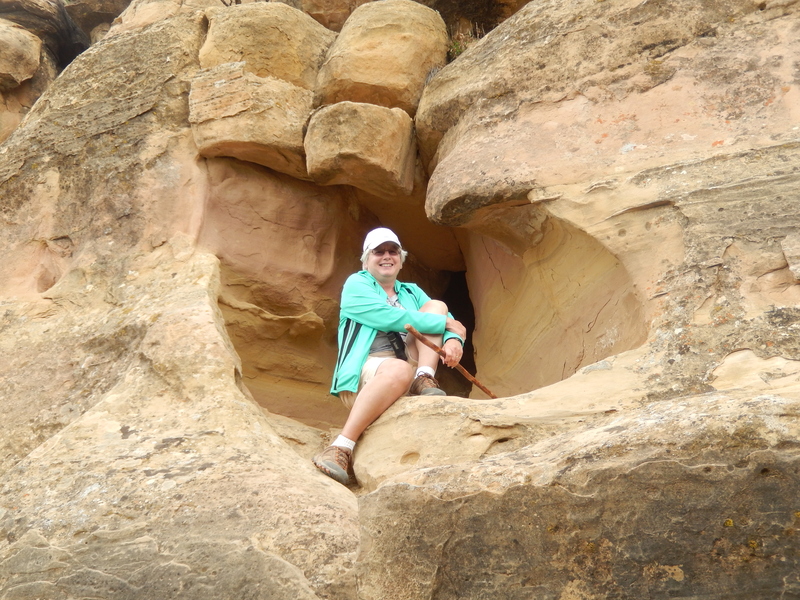 This entry was posted in Colorado, Fulltime RV, Michigan Traveler, National Parks and tagged Ancient Pueblo Indians, backcountry hiking, Balcony House, Civilian Conservation Corps, cliff dwelling, Cliff Palace, fifth wheel trailer, full-time RV, fulltime RV, kiva, Petroglyph, Ranger-led Hike, RV Forums, Spruce House. Bookmark the permalink.